The Tribe of Gimogash - The oldest known Honor Program of them all, it predates The Order of the Arrow by one year. It is stated in the 1920 Toledo (Ohio) Council Gimogash handbook that "The first troop of Gimogash was formed on May 16, 1914 under adult leadership" by their former Council Executive, J. St Clair Mendenhall. What is interesting about this is that Mr. Mendenhall was not their executive on May 16, 1914. He was employed at that point by the Kansas City, Missouri Council, probably as their executive but that is not confirmed. He arrived in Toledo some time after August 11, 1914 which was the day that Toledo's part time executive , James B. Ecker drowned trying to save two scouts (one of whom was his nephew) who also drowned at their summer camp session. Toledo was not the birthplace of Gimogash although it was certainly the "homebase" of it. It is not known what happened to the original Kansas City tribe although it apparently went by the wayside after Mendenhall left. The 4M program existed in the Kansas City area about that time and the Tribe of Mic O Say was started there in 1929. Gimogash was not a camp honor society on the same order as the OA and Ku-Ni-Eh but was a year round older boy program with ceremony and ranks that was focused on service, honor and leadership. In Toledo it was an actual troop of all older boys independent of the other regular troops although you had to be a member of a regular troop to be in the Gimogash. It was composed mostly of Eagle Scouts in Toledo or at least it produced many Eagle Scouts and was very popular. There were 96 Eagle medals awarded in the nation in 1915 and 103 in 1916. In 1919 Toledo sent 19 Eagle Scouts on a trip east, all members of the Tribe of Gimogash. It was an extraordinary achievement, a testament to the program. Toledo did have a camp honor program that is known to have existed in 1915 (it is featured in their 1915 camp manual) called the Order of the Mystic Circle. Mendenhall may have brought this from Kansas City when he arrived. I am told Mr. Mendenhall was the fourth or fifth Eagle Scout in the country although I have never confirmed it. Much has been written about Gimogash and the program existed in reportedly dozens of councils. Gimogash was created to try to spark interest in older boys to stay in scouting. The word Gimogash meant "the silent power" which was service to others. The original Gimogash in Toledo heavily stressed service and many examples are noted in a 1918 Toledo Council yearbook. There were three degrees of Gimogash. First Degree was for First Class Scouts, Second Degree was for Life & Star Scouts and Third Degree was for Eagle Scouts. Each scout received an emblem (patch), pin and stationary. To be eligible to join, you had to be at least first class rank, 15 years old (and not yet 21), active in a troop at least six months, have five merit badges, respond to at least five calls for service and register at council headquarters for service. 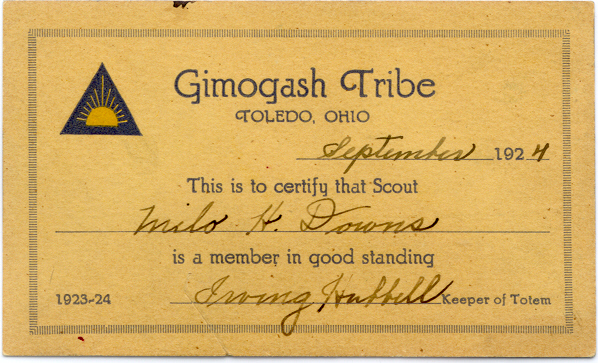 According to an article in the very first issue of the Toledo Council newsletter (The Toledo Scout)dated February 20, 1915, members of Gimogash had to earn a merit badge a month to maintain their membership. The Gimogash troop met the first and third Monday of each month from 7:30-9pm. Membership was on top of your regular troop membership. Gimogash was a group that seemed to have a lot of "3's" within it. The patch was three sided and there were three focal points (honor, leadership and service). The initiation ceremony used three tipis placed in a triangle with three containers containing three substances and had three Indians involved. Besides the initiation ritual there was a ceremony after each degree. The layout of the initiation ceremony was quite interesting as it cryptically created the patch design when viewed from above. Potential members were recommended by their scout leader to the Gimogash group then the Gimogash discussed his attitude and service record. If elected, he reported to camp where he spent the night and then worked at different tasks throughout the day on Saturday with little food (like the OA). Candidates for the initiation ritual were roped together then taken single file to the council area. Here the candidate made his final preparation and as he was led to the final area a hidden Gimogash member would make the sound of an owl. The final area had three Tipis set up in a triangle formation with a small fire burning in front of the center one between the two other tipis. (From a birdseye view it was the triangular Gimogash patch with the fire being the rising sun). The Gimogash chief (in full regalia) would be standing in front of the rear centered Tipi with two assistant chiefs (also in full regalia) in front of the two forward Tipis. There would be three one gallon cans buried into the ground between the fire and the Chiefs. One can was filled with hot wood ashes, one with water and one with dirt. The candidate would dip his hand into each one. The hot ash can was to show bravery, the water to show a scout is clean in body and speech and the dirt to show that he will return to the earth from which he came. After this they were given their membership patch and taken to a feast. Each degree required besides the rank advancement, recruiting and training five new Tenderfoot scouts and a specified number of hours of service. This was five new Tenderfoot scouts for EACH degree. To reward the members for the service they provided there was an annual trip. To go you had to be an Eagle scout, recruit and train five additional Tenderfoot scouts (on top of the 15 already recruited), serve five troops in a major capacity and serve the council headquarters in five special tasks. Nineteen Eagle scouts attended the 1919 trip touring 50 large cities and 10 states with the trip lasting 23 days. The 1920 trip was to Michigan's Upper Peninsula wilderness. A Gimogash handbook was published after November 1, 1919 and before the planned 1920 trip by the Toledo Area Council. The original Toledo Gimogash advisor was not Mendenhall but was an individual named Will Schroeder. He held the position for three years then Louis R. Schenck was appointed advisor. (In the Summer 1995 issue of The Journal, a private scouting historical publication, Schenck has been misidentified as J. St. Clair Mendenhall in the Gimogash article that was published.) Mendenhall resigned from the Toledo Council on September 1, 1919. His assistant, Ray Loftus, replaced him on a temporary basis until Paul B. Samson was hired on November 1, 1919. Mr. Samson was the executive of the Washtenaw-Livingstone Council in Ann Arbor, Michigan. The Scouter that is top row, 4th from the right, was Paul Samson who was the Toledo executive who followed J. St. Clair Mendenhall in 1919. He was credited with spreading Gimogash to the most councils. I believe he was there through 1922. He was hired from Ypsilanti Michigan (by Ann Arbor) where he had been their exec. The Scouter 6th from the right (wearing glasses looking straight forward) was the Gimogash Advisor, Louis R. Schenck. Mendenhall is not in the photo. From the 1920 Gimogash Handbook. "Under Chief Samson, Gimogash had it's greatest growth and several tribes were organized in other scout councils, with boys and leaders coming to Toledo for the initiation. Eagle Scout trips, which had started with an automobile tour to the east coast and back under Mr. Mendenhall, were resumed under Mr. Samson. The best known were the canoe trips down the Ausable River from Grayling, MI to Oscoda, MI." (quoted from a Toledo Council history booklet)Tribes that were started in other councils traveled to Toledo to receive the initial induction ceremony. The Scranton Tribe did this in 1921 when they started. Gimogash had already spread to a number of cities by 1919 as a two day sectional Gimogash conference was held in Toledo. It was attended by an unspecified number of cities. In that same year, and perhaps at that conference, the Gimogash Cup, pictured below, was presented to J. St. Clair Mendenhall. 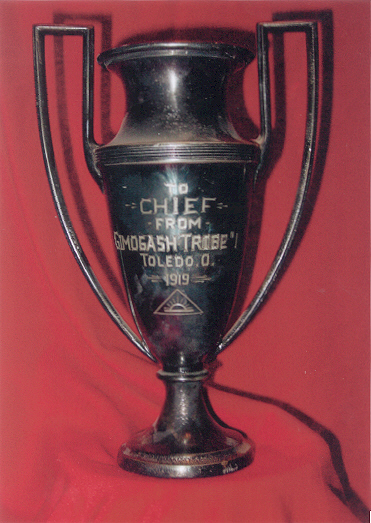 The cup is inscribed "To Chief From Gimogash Tribe #1, Toledo Ohio 1919" and has the Gimogash patch engraved into it as well. It is a rather heavy solid sterling silver cup that has patina on it making it the black color. New troops in Toledo had a Gimogash member as an advisor for a month or so to help get it on it's feet. One rather unusual thing I just discovered was that the youth members of the Toledo Gimogash had a hat patch about three inches wide at the base that was worn on the front of their campaign hats. In a large group picture taken in April, 1918 of a Middle West Scout Conference held in Toledo, the members of Gimogash are included in the group with at least four having the patch on their hat. There was also a large patch that was worn on a sweater. Anyone who has come across a hat patch probably assumes they have a pocket patch although it doesn't appear that such a thing existed in the early days of Gimogash at Toledo. The Journal article states that "All versions of this emblem were basically the same design. The symbol of Gimogash is a white triangle with a black inner triangle and a rising sun colored orange on a blue background". 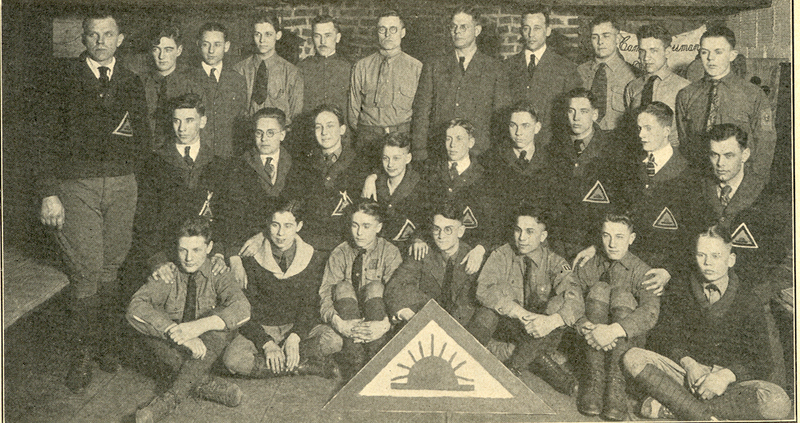 The 1918 yearbook has a full color picture of the emblem and it is a black outer triangle with a blue inner triangle with a yellow rising sun with a black bar under the sun. There are 13 rays coming off the sun. Athough the picture showing the hat patch is black and white, there is no outer white triangle that can be seen. The outer triangle appears to be black or is a very dark color. 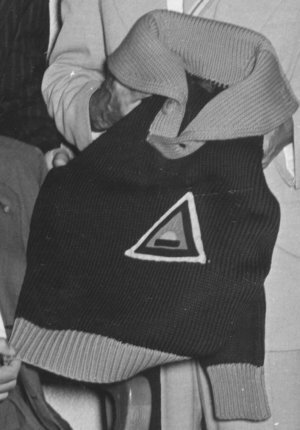 The sweater patch however has a white outer triangle. Perhaps some of the hat patches have been found and labeled fakes because of having no white triangle. I do not know. The following is quoted directly from the 1920 Toledo Gimogash handbook... "The establishment of chapters in other cities increases the attractiveness of the plan and gives life to the expression, 'a scout is a brother to every other scout'. However, there shall be no national organization including in its membership local chapters of Gimogash, nor any part national or district organization. Scouting is a movement, not an organization - a training - not a club - Gimogash aims to be only a training, an additional program in scouting - and not a distinct organization." The Gimogash people did not want the group to be a seperate national organization or to become "bigger than scouting". It appears this viewpoint was written by Mr. Samson and not Mr. Mendenhall as earlier thought. It should be noted that this philosophy allowed Gimogash to automatically fall within the guidelines set forth at the 1922 Professional Scouters National Meeting concerning scout honor groups. Close-up of Sweater This photo is of four of the original Gimogash members of Toledo Gimogash. They were members during the Mendenhall era of 1914-1919. The sweater would be one of the originals. One of them was an editor for the Toledo Blade newspaper. He accompanied Admiral Byrd during one of his expeditions to the south pole as an Eagle Scout. Paul Siple was the first Eagle to do this. Below is a membership card from Toledo dated 1924. Gimogash existed in Parkersburg, W. Virginia; Bay City, Michigan; Flint, Michigan; Toledo, Ohio; Scranton, Pennsylvania (1921-1966); Dayton, Ohio; Danville, Illinois; Terre Haute, Indiana; Louisville, Kentucky; Holland, Michigan; Logansport, Indiana; Elkhart, Indiana and probably other locations still forgotten. It is still unknown at what point Gimogash died out in Toledo and why. It is known that Toledo had a chapter of the Knights of Dunamis for a number of years. Perhaps the Knights were brought in by a council executive and that displaced Gimogash. The Eagle trips lasted for many years but it was the Knights that was the group doing the later ones. Considering that Gimogash had many Eagles and the Knights were strictly an Eagle Scout society that may be the answer to what happened to Gimogash although this is in no way confirmed but simply conjecture at this point. Toledo did not start the OA program until 1958, long after most of the rest of the country was using it. Mohican Tribe of Gimogash - Created in 1921 in Scranton, Pennsylvania it existed until about 1966 when it was displaced by the OA. 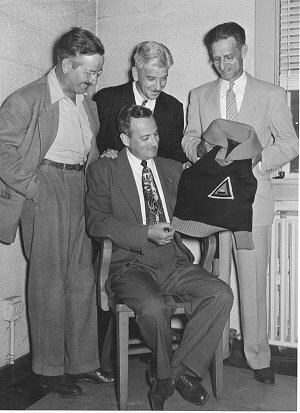 The original OA organizational meeting was held October 1, 1958. The Scranton Gimogash was created after the Council Executive (Donald Gulick), Council Secretary and three scouts made a trip to Toledo to investigate the organization. This group was reportedly the last of the many Gimogash locations that once existed. There were two versions of their small patch. The original was cut with metal dies then apparently in the 1940's they (the dies) were lost and the patches were hand cut (and appear to be handmade) after that. The original patches were black border,light blue inner triangle, orange sun, three orange rays and black bar. The newer patch was smaller than the original. These patches were worn on the top of the left sleeve in the 1920's and later were worn on the scout campaign hats until they went out of style in the late 1940's, then were worn on the pocket. 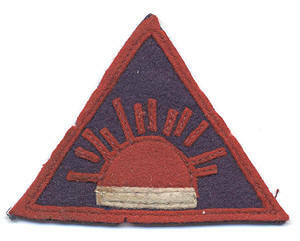 Members also had a pin which was a colloid triangle with the black bar and rising sun. The group burned their ceremonial costumes in a fire but this was not done as some sort of protest against the OA. They had been stored in a wet condition and got ruined from it and couldn't be saved so the members simply burned them. It has been reported in other accounts that this was done in anger. A former Gimogash chief who was there has given the information of the wet storage. As I understand it though, the surviving members still refuse to join the OA. The membership of the Scranton Tribe of Gimogash group (called the Mohican Tribe) was 240 with 46 of them being considered active according to minutes of the initial "Order of the Arrow-Gimogash Meeting" held on July 24, 1958. The meeting was to consider starting up the OA. The minutes further state that most of the Gimogash members were adults and that members were chosen by existing members. The last paragraph of the meeting minutes states that "There seemed to be no question but that the two organizations, involving as they do, entirely difficult (a typo, I believe) age groups, could not both exist and carry on traditional activities side by side." It then ends with "All were most pleased with the outcome of the meeting". Minutes of the OA organizational meeting on October 1, 1958 state that "It was reported that the Gimogash in their September meeting endorsed the formation of an Order of the Arrow Lodge...", then went on to say "It was generally thought that this was a very fine development". Both sets of minutes were written by the Council Executive of that time period. There were eight existing OA members in the council when the decision was made to go with the OA. There exists at the current council's camp a flag pole installed in 1966 that has an engraved plate on it that says "Presented by the Mohican Tribe of Gimogash". It has been reported that the last of the Gimogash treasury was used to purchase this flagpole as well as a second permanent one and two portable ones for the camp chapel. It is also reported the group never technically dissolved itself, they just quit meeting. There are a number of it's brethren still around. Notes regarding the images: The patch image is taken directly from the 1918 Toledo Council Victory yearbook. 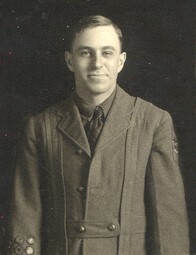 The other is a picture of J. St. Clair Mendenhall taken in 1918. He was the creator of Gimogash. Additional Information - After Gimogash's founder, J. St Clair Mendenhall, was hired as the exec of Kansas City in 1912 and received the Eagle Scout award in 1913 so he would have been about 22 years old when he received it. After he resigned from Scouting and left Toledo in 1919, he went to New York and became the director of Junior Achievement for New York City and later was a field director for the organization. He retired as a teacher in Northville, N.Y . where he taught industrial arts after WWII. He died on October 28, 1967 at age 76. He is buried in Riverside Cemetary in Coxsackie, N.Y.
Paul Samson, who followed him in Toledo as exec and is credited with really expanding Gimogash, died 13 days after Mendenhall at age 88 in Michigan. The information you put together concerning the Tribe of Gimogash is really great. I wanted to write you to provide you with some additional information. The Tribe of Gimogash was also used in Middletown, Ohio. I have seen old newspaper articles from Middletown talking about Gimogash activities. Unfortunately I do not have a copy or scan of any of the articles to send you. Also, I have attached a scan of a Gimogash patch I obtained from an estate auction of Pearl Whitehead. As I understand it, he was a scouter from Dayton, OH who was also very active on the region level. The patch is 3" on each side.